She’s more huggy now! – 365, 353, originally uploaded by Fluttering By. 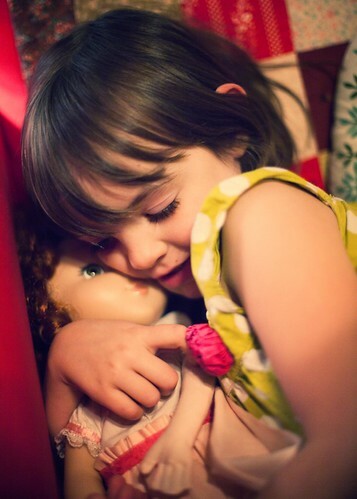 One of Molly’s favorite dolls lost her arm in an infortunate accident almost a year ago. It was not the fixable kind of break (we tried several times with glue and even duck tape) and the poor thing has never quite been the same. While we explained to Molly that sometimes things break and can’t be fixed and it’s okay, all the while Molly swore up and down that she still was her dolly and it was okay… it wasn’t. I sewed her a new one. I even made it with a little bump at the end that fits into the socket that once her old arm snuggly fit. It moves, it poses in place, and it’s stuffed with lovely wool. Molly saw it finished, gave her a big squeeze and exclaimed, "She’s more huggy now!"